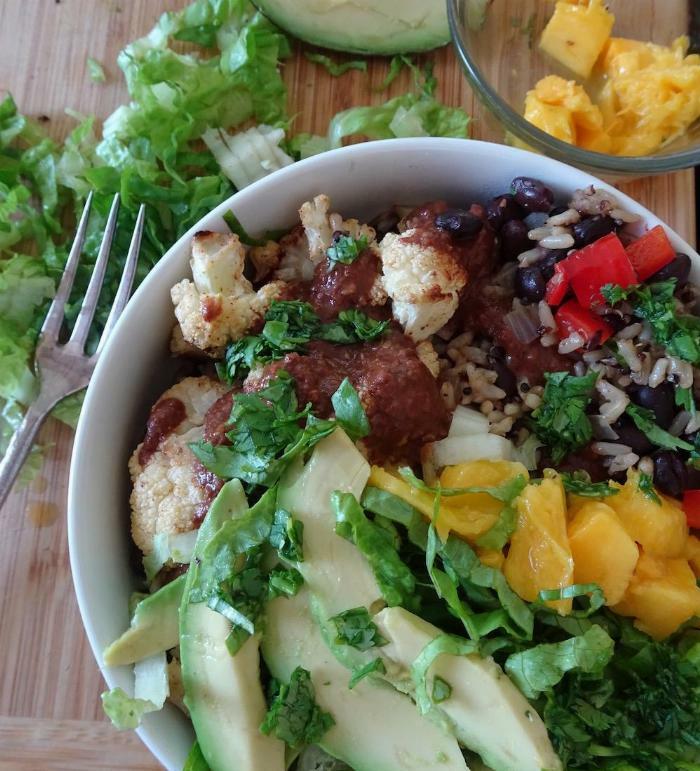 A vegan bowl teeming with the flavors of Baja California, including a magnificent (and relatively quick) way to make the great Aztec-influenced sauce, molé. Though the ingredient list is long and there are more steps than I usually like to include, the preparation is quite simple. 1Preheat oven to 400º. Toss cauliflower florets in bowl with oil and spice mix. Spread on a parchment-lined baking sheet. Place in oven, setting timer for 20 minutes. Stir cauliflower, and roast an additional 10-15 minutes, until browned and soft. 2While cauliflower cooks, make the mole sauce: Boil the broth. Place raisins in small bowl, and pour 2 tablespoons of the boiling broth over them. 3Grind the almonds in a coffee grinder or food processor. Heat the peanut oil in a flat-bottomed skillet over medium high heat. Tear up the tortilla in smallish pieces and add to oil. Add ground almonds and sesame seeds and reduce heat to medium; stir until brown, approximately 4 minutes. 4Scrape almond mixture into a blender along with 1/4 cup of the hot broth. Process on low to medium speed; as motor runs, add chili powder, paprika and cayenne, then the raisins, chopped onions and garlic, and tomato puree. Slowly add remaining stock, then process on high. Pour back into pan on the stove and heat over low-medium heat. Add chocolate, extracts, and cinnamon and cloves. Stir to melt chocolate, and continue to cook over low-medium heat. 5Heat peanut oil in flat-bottomed skillet over medium high heat. Add onions, and cook 4 minutes, until they begin to be translucent and golden around the edges. Add peppers, and cook 4 minutes more. Stir in rice mix or rice and black beans. Add 2 tablespoons of broth. Stir until completely absorbed. 6Assemble bowl: Make a bed of rice mix and cauliflower. Scoop 1/4 to 1/3 cup of mole sauce over the bowl. Top with shredded lettuce, chopped mango, and avocado slices.